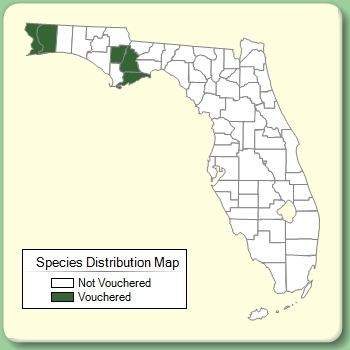 Citation HYPERICUM TUBULOSUM Walter, Fl. Carol. 191. 1788. Type: GEORGIA: Chattahoochee Co.: NE corner of Fort Benning Military Reservation, 17.5 mi. NE of Cusseta, 16 Oct 1997, Allison 10271 (neotype: USCH). Neotypified by D. B. Ward, J. Bot. Res. Inst. Texas 2: 1281. 2008. Elodes tubulosa Elodes tubulosa (Walter) Pursh, Fl. Amer. Sept. 379. 1814. 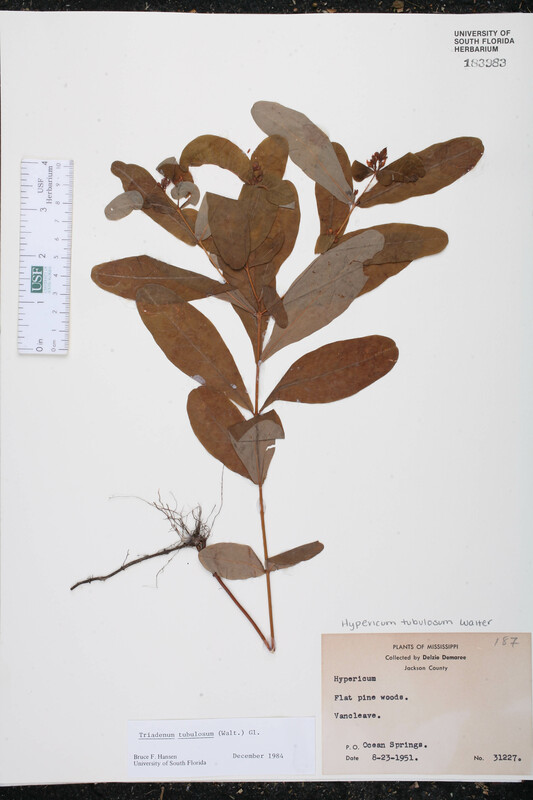 BASIONYM: Hypericum tubulosum Walter 1788. Gardenia longifolia Gardenia longifolia (Small) Farwell, Amer. Midl. Naturalist 8: 34. 1922, non G. Don 1834. BASIONYM: Triadenum longifolium Small 1898. Hypericum petiolatum var. 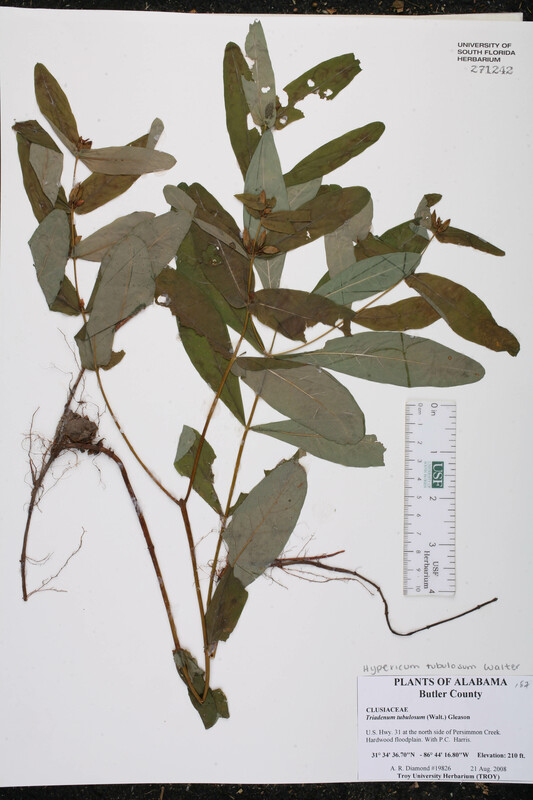 tubulosum Hypericum petiolatum Walter, var. tubulosum (Walter) Fernald, Rhodora 38: 436. 1936. 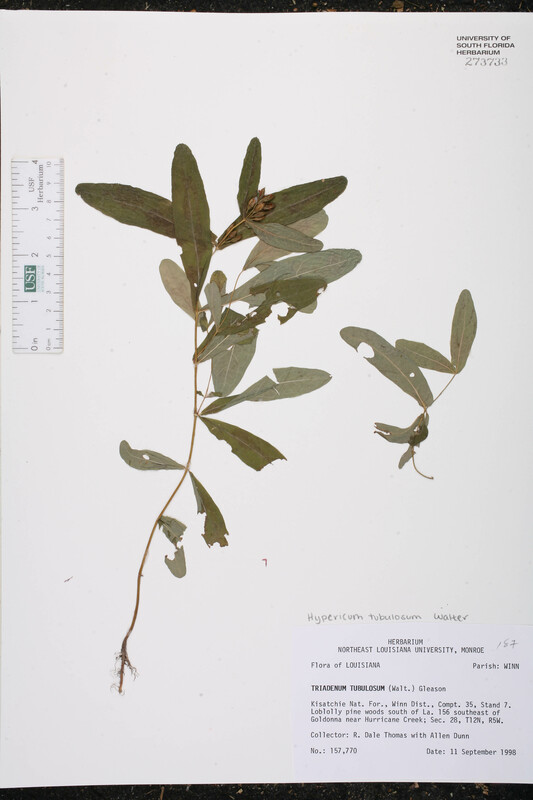 BASIONYM: Hypericum tubulosum Walter 1788. Hypericum virginicum subsp. tubulosum Hypericum virginicum Linnaeus, subsp. tubulosum (Walter) E. Murray, Kalmia 13: 7. 1983. BASIONYM: Hypericum tubulosum Walter 1788. Hypericum virginicum var. tubulosum Hypericum virginicum Linnaeus, var. tubulosum (Walter) E. Murray, Kalmia 13: 7. 1983. 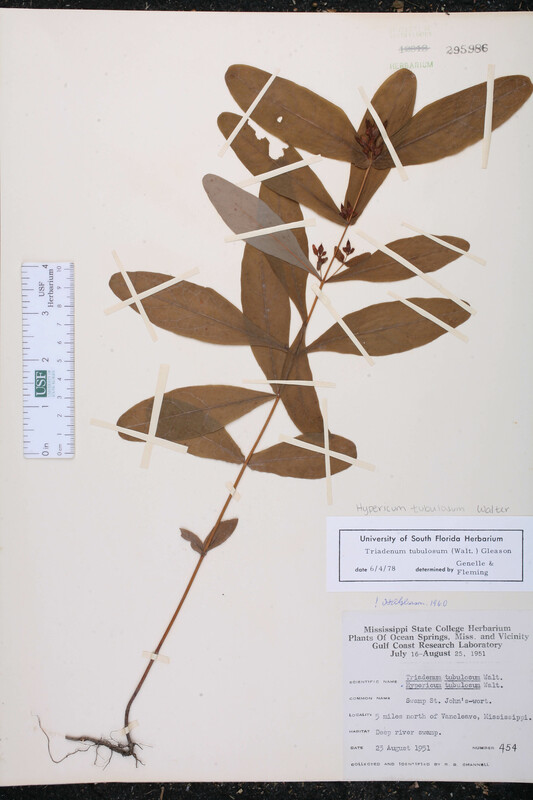 BASIONYM: Hypericum tubulosum Walter 1788. Hypericum walteri var. tubulosum Hypericum walteri J. F. Gmelin, var. tubulosum (Walter) Lott, J. Arnold Arbor. 19: 151. 1938. BASIONYM: Hypericum tubulosum Walter 1788. Triadenum longifolium Triadenum longifolium Small, Bull. Torrey Bot. Club 25: 140. 1898. TYPE: "prope Summerville, Alabama, et ad fluv. Apalachicola, Florida", Aug-Oct 1843, Rugel s.n. (holotype: NY). Triadenum tubulosum Triadenum tubulosum (Walter) Gleason, Phytologia 2: 289. 1947. Hypericum tubulosum Walter 1788. TYPE: GEORGIA: Chattahoochee Co.: NE corner of Fort Benning Military Reservation, 17.5 mi. NE of Cusseta, 16 Oct 1997, Allison 10271 (neotype: USCH). Neotypified by D. B. Ward, J. Bot. Res. Inst. Texas 2: 1281. 2008. Elodes pauciflora Elodes pauciflora Spach, Ann. Sci. Nat., Bot., ser. 2. 5: 169. 1836.